Siwertell delivered this ship loader to Alsons Cement Corporation, as part of Uzinexportimport’s equipment supply for the Alsons Cement expansion plant project at Lugait, Mindanao in the Philippines. Focusing on high capacity and environmentally friendly operation, the ship loader design is based on the well-proven screw conveyor technology from the Siwertell continuous screw-type ship unloaders. 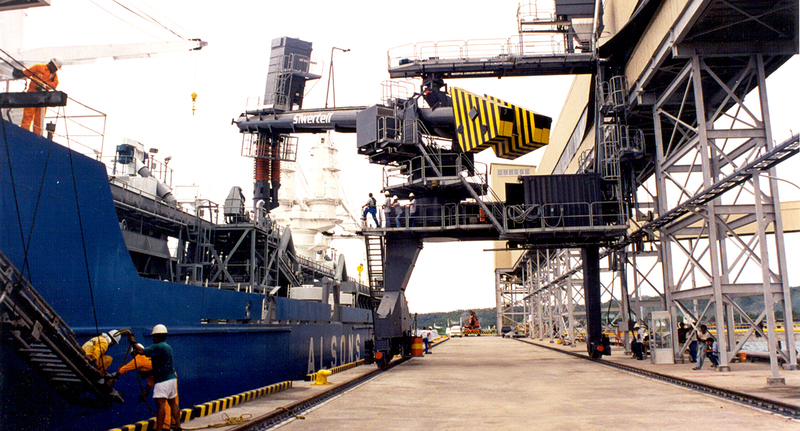 The rail-mounted ship loader in Mindanao is dedicated to serving cement carriers operated by Alsons Cement. siwertell was also awarded the contract for conversion of two vessels installing selfunloaders. By virtue of the unit’s design, the demand for a dust free loading operation was successfully met. The Siwertell loaders are designed with a totally enclosed conveying line from the inlet to the outlet, and the airflow in the loader is strictly controlled. Further the telescopic spout and dust-collecting system prevents the escape of dust. Loading is automatically controlled, and any dust generated is collected and returned to the conveying system. These features all contribute to that Siwertell offer one of the most environmentally friendly bulk handling systems on the market.